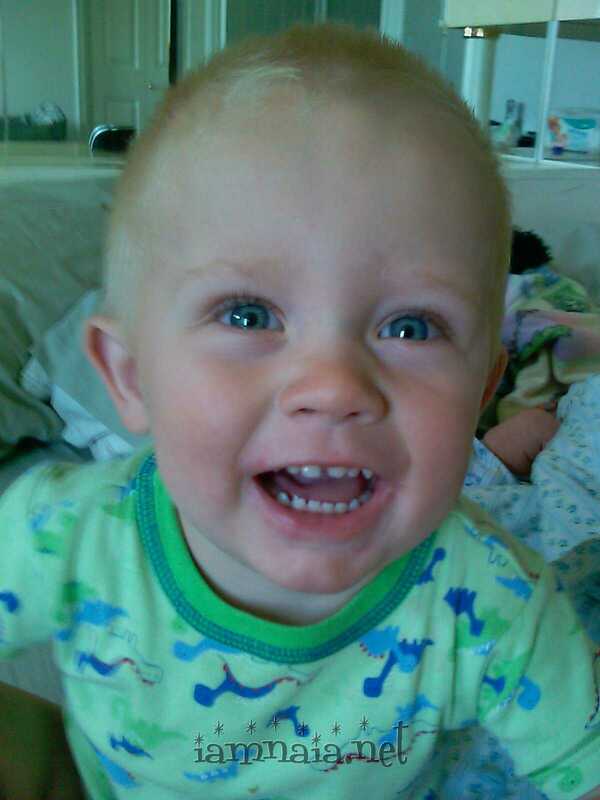 A few random pictures before getting into the heart of the next fiasco/scare/horror regarding Caiden. This picture was taken shortly after Brendan was born – in late May of 2008. His 2nd birthday in Pinedale, Wyoming. His daddy was working there and I drove Caiden out there to celebrate with daddy. Out of order but a very gorgeous picture. He was playing in a yard sale bathtub duck that I found. 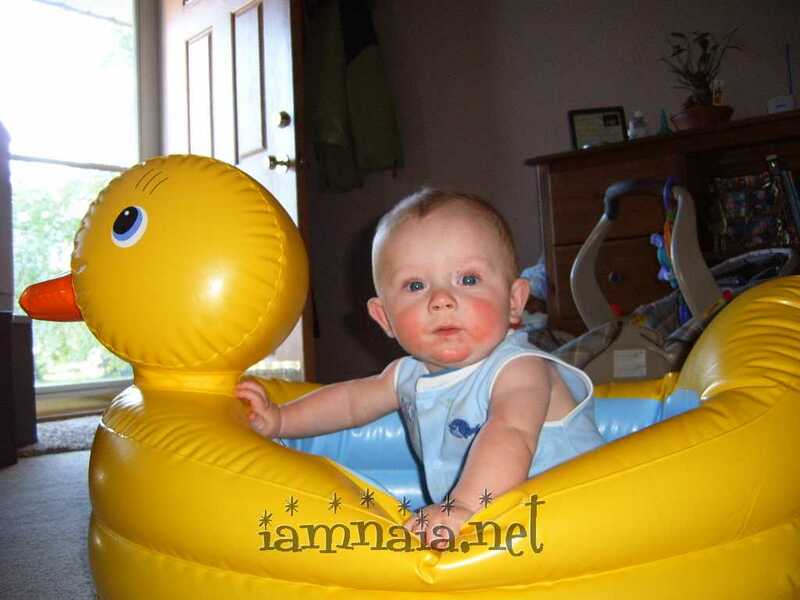 He loved to play in that thing and we never used it for bath time. 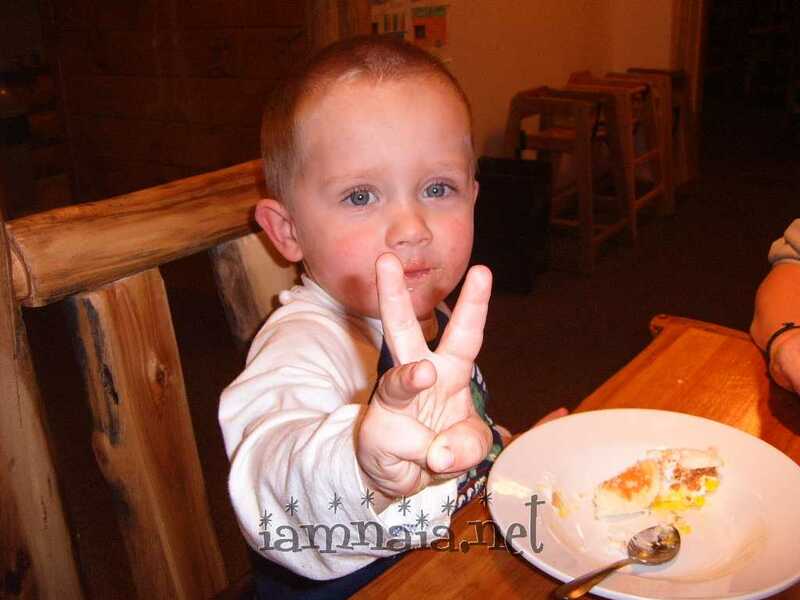 His third birthday, in 2010, also in Pinedale, Wyoming with daddy (he was still working far away). The next story was written by daddy. I asked him to summarize what happened to Caiden in October of 2009. This would become something we fret and worry about every fall for the next 3 years. What daddy is trying to relate is the day that the boys and I woke up (in October of 2010) and I had to listen to Caiden hack and cough like he wasn’t getting any air. I quickly started to freak out – and I’m used to Caiden having problems. I threw a bunch of clothes in the car for Brendan and quickly called the daycare lady. Practically throwing Brendan at her at such an early hour in the morning, Caiden and I headed off to the emergency room. On the way out of her driveway, the low gas light came on in the car and I swore. I stopped by to put a couple bucks in the tank and I bought Caiden a bottle of water to drink on the way to the hospital. When we got there, I told them that my son was having a hard time breathing. They whisked us back to an emergency table and we sat there for quite some time while my boy was working on being as annoying and funny as possible. He drank his water and enjoyed himself immensely while waiting. 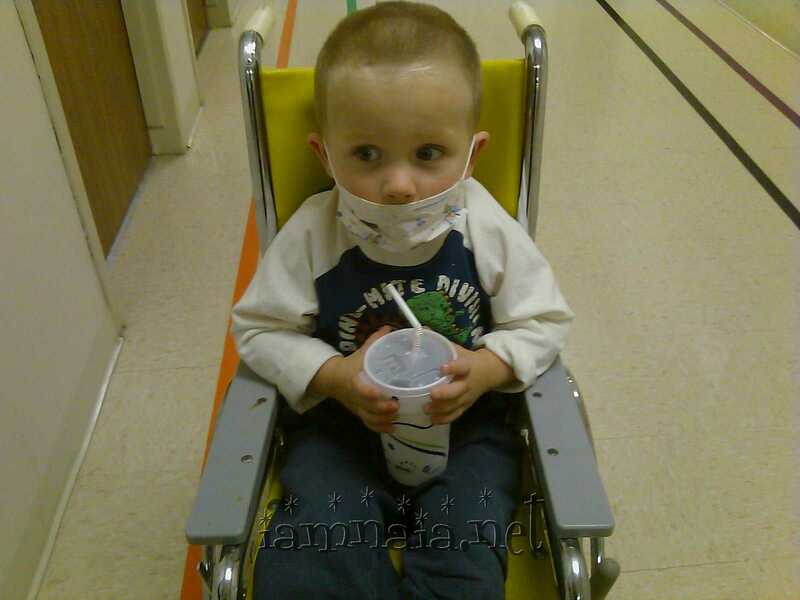 Eventually, it was decided that he was going to have to stay in the hospital for evaluation; especially because his blood oxygen levels kept dropping lower and lower. The 87 is his Blood Oxygen Level and 97 is his heartbeats per minute. It ended up getting into the low 80s, at one point. We were in the hospital close to 50 hours and they eventually freed him. It was awful for me, as the mother, to watch my son locked down in the hospital for long hours but he was a real trooper. He didn’t fight the idea of staying very often and he did pretty good, as a whole. The only part he didn’t like was the idea of sitting still while the doctors and nurses did their thing. The worst part, for me, was watching his blood oxygen drop dangerously when he would finally fall asleep. I barely got any sleep, myself, as I watched his numbers all night long and woke at the slightest beep of them dropping too low. A little more than 2 days with no sleep does tear up a mother something fierce. After the second night, they decided that they would put him on some allergy medication and send him home. 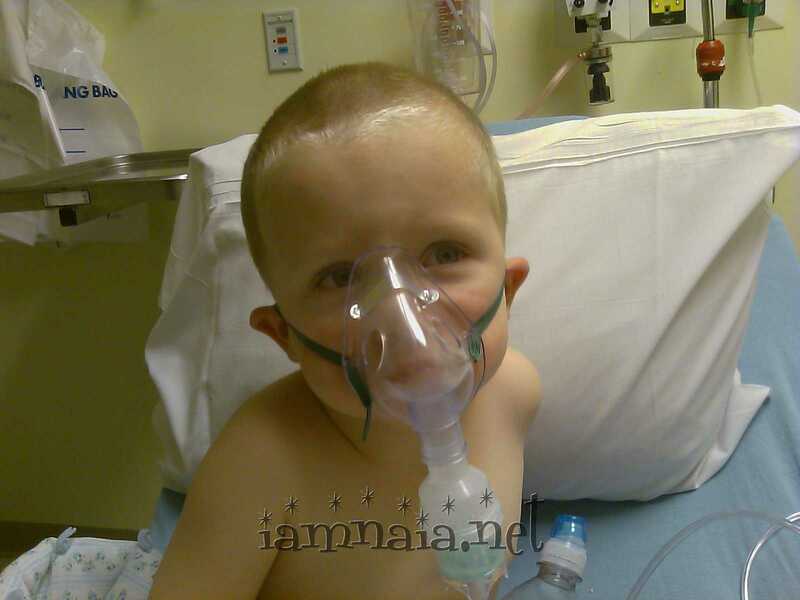 He was to have a nebulizer and two different allergy meds on a constant basis: Zyrtec and Singulair. Eventually, I would take him off of Zyrtec and leave him on Singulair. He seemed to clear up after a month or two and I am the type to not allow over-medicating children (or myself). His daddy didn’t agree with me but I did promise to put him back on it the second I saw some signs of the problem returning. Which it did – in October of 2010. At this point, it seemed to be a fall weather thing. His breathing would nose-dive and he’d start having a hard time breathing. 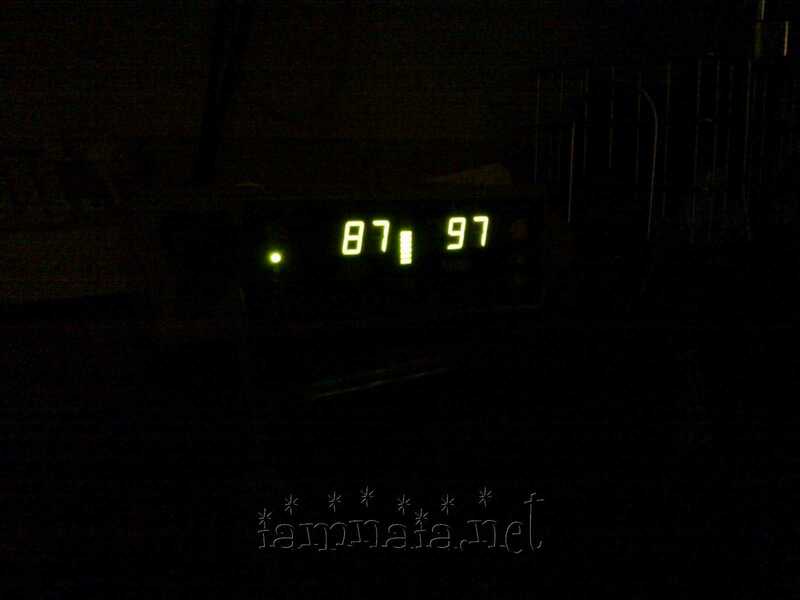 This time, he went in the hospital for a little over 24 hours. His return to a “normal” state was faster as the doctors already knew what was happening and how to handle it. I admit that I pushed the doctor to do something like return him to the hospital because I was so scared of what would happen if we didn’t do what was necessary. It appeared that the clean air in the hospital gave him what he needed to shake the problems he had with the Idaho weather in the fall. 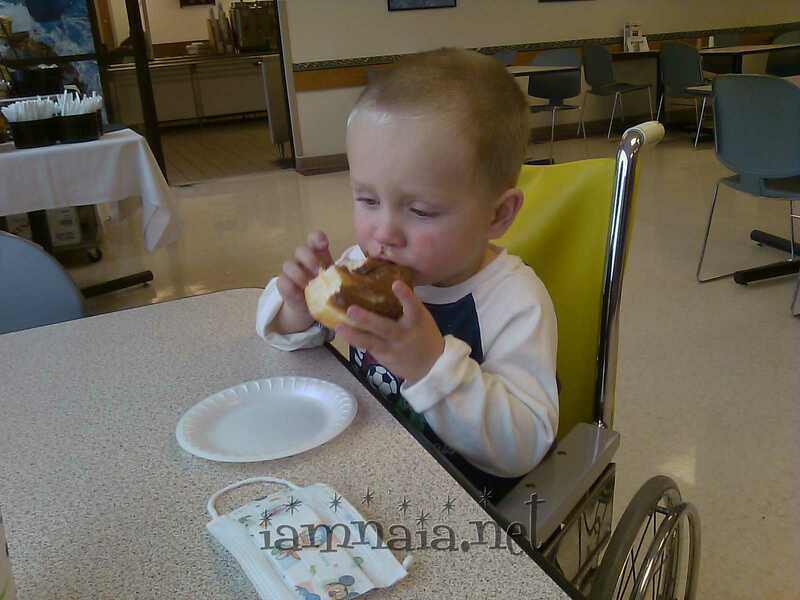 For all of fall and winter 2011, we watched him closely, trying to keep him out of the hospital. It worked and he didn’t return in 2011. He did, however, end up with stitches again in 2011 but that’s a story for later. He laughed and that was the end of my first concert experience. Fast forward to 2009. My first-born was 3 and my 2nd child was just 1. It was a concert for the Trans Siberian Orchestra in Salt Lake City the day before Thanksgiving. I had all the plans laid out. Since Daddy was working in North Dakota, I had friends helping me with the watching of my children and my former mother-in-law was going to meet me for the concert and go with me. I was driving towards the concert and I got a call. 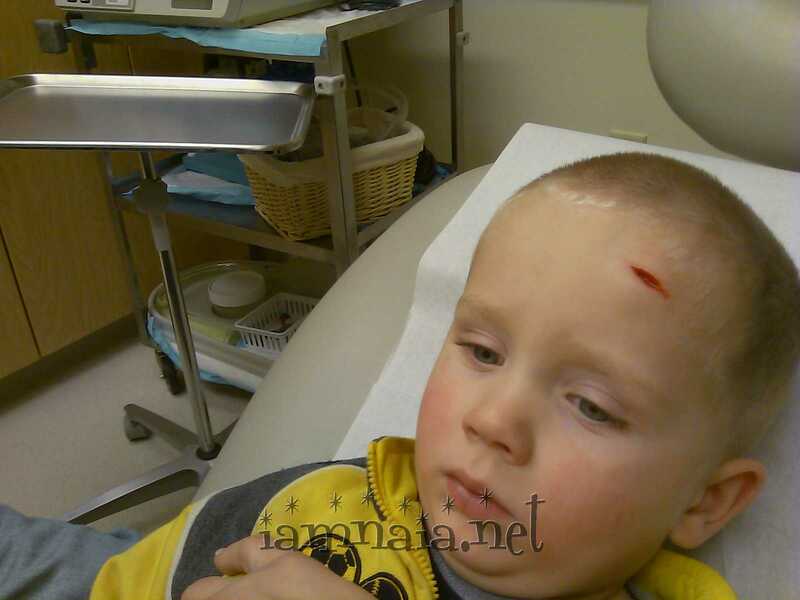 My son had fallen and hit his head on a stone fireplace, splitting it wide open. With extreme reluctance, I turned around and headed back to town. I called my mother-in-law and she was ok with not going, she wasn’t feeling that well and was trying to figure out how to break the news to me. I went to the doctor’s office and met my daycare provider there with Caiden. He got 4 stitches and was sent home – and I stayed home, as well. And I missed my second concert of my life. I have decided that, in the future, when my boys ask me to go to a concert, I am going to tell them no and why. Just for spite. To date, I have not ventured to attempt to go to any other concert. At this point, it’s such a fiasco, trying to go, it would have to be an amazing concert for me to buy tickets and try to go. 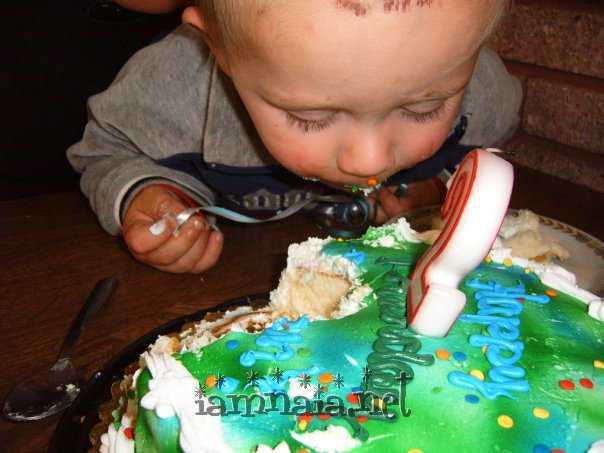 During the summer of 2011, Caiden had another mishap. He got bit by a mosquito on his ear. Apparently, he body has a serious aversion to mosquitoes. This is only the first of many problems with mosquitoes. His ear, to this day, is still not quite right but you can’t tell unless you know what you’re looking for. 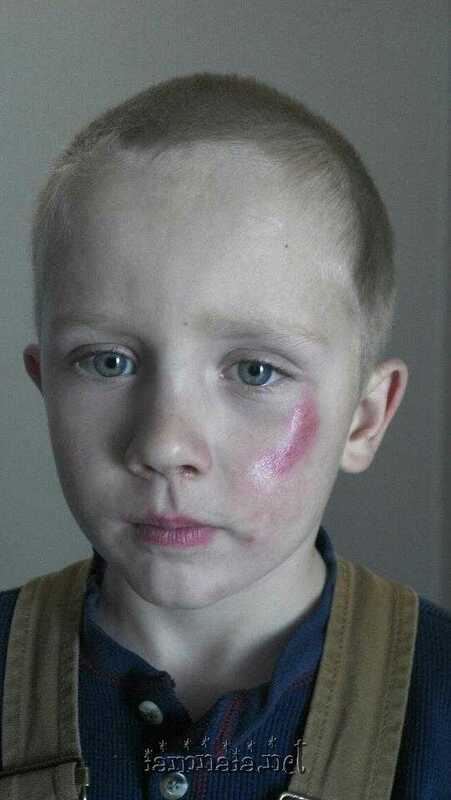 It was the first week of kindergarten when he fell and skinned his face up at recess. It was an awful moment for me when he came up all banged up but we quickly go over it. I had to recognize the fact that my child was (and is) accident prone, at times. And no, this isn’t a way of covering up for abuse. He really does get himself into some crappy positions and gets hurt. Speaking of stitches, he got another set of them in 2011. It was around the Thanksgiving time and he was being a complete and total brat during dinner. I finally set him to go sit on his bed while we all finished our eating. He crawled on hands and knees up the stairs and took forever about it. We were actually laughing at how theatrical he was being until we heard a thud and a scream, followed by much crying. Racing upstairs, I found him on the floor, holding his head. Blood was pouring out from behind his fingers. 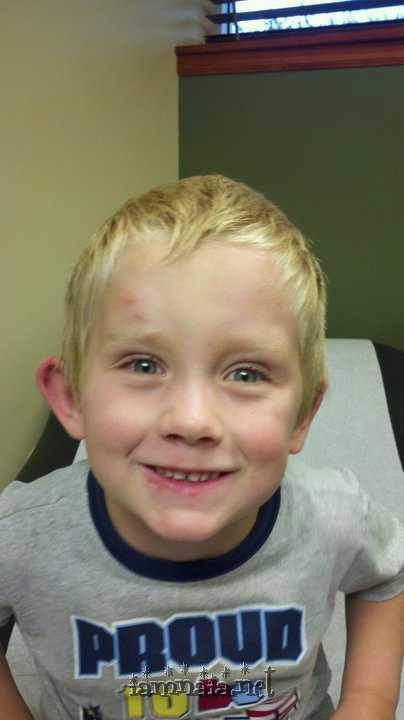 From what the doctor said, Caiden said and what we observed, we have pieced together what happened. Apparently, he decided the bed wasn’t good enough to sit on, so he decided to sit on his nightstand. It was an older table, made of solid marble and wood. He jumped up on the marble table part and it broke, throwing him to the floor. The marble smacked him in the head and his head came down, right on top of the now-exposed screw in the wood that was holding the marble in place. 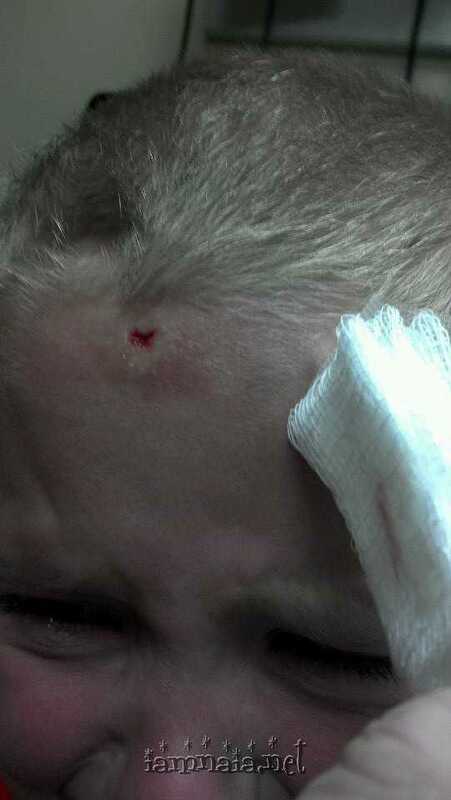 He impaled his head on the screw – not very deep but mom freaked out. We raced to an all-night health center and told the doctor we just needed to be sure he didn’t break anything in the process. The doctor told us that the screw pierced his skin, skidded off his bone and tore the skin. He got two stitches for his troubles in his forehead and a big lecture from mom about doing what she says to do. It doesn’t look as bad when it is all cleaned up. So far, this year (2012), he hasn’t had any serious upsets. He got hurt a time or two on the playground at school but that was minor. He got quite a bit sick with the flu or some-such and ended up on his nebulizer (scaring me about another doctor visit) for a little bit, but otherwise, doing pretty good. Through it all, though, we’ve fought to keep him alive and happy and as healthy as we can, loving him for who he is and trying not to blame him for his fiasco as a baby. That’s something that I constantly work on and, with Jen around to spell me when needed, it seems to be going pretty good. Since we moved into this house, I’ve seen a huge change in my son. It appears that he loves and trusts and is a part of life like never before. Growing up or finally relaxing into his life. Whichever it is, I am glad he is my son and wouldn’t give him up for the world. I’m so proud of everything he has accomplished and overcome in his life. There will be one more post as I catch on his birthday and throw a few more pictures at you.